I’m so pleased to be wearing two hats—participant and moderator too!—at the annual Sisters in Crime panel at Alexandria’s Beatley Library. I’ll be joining E.A. 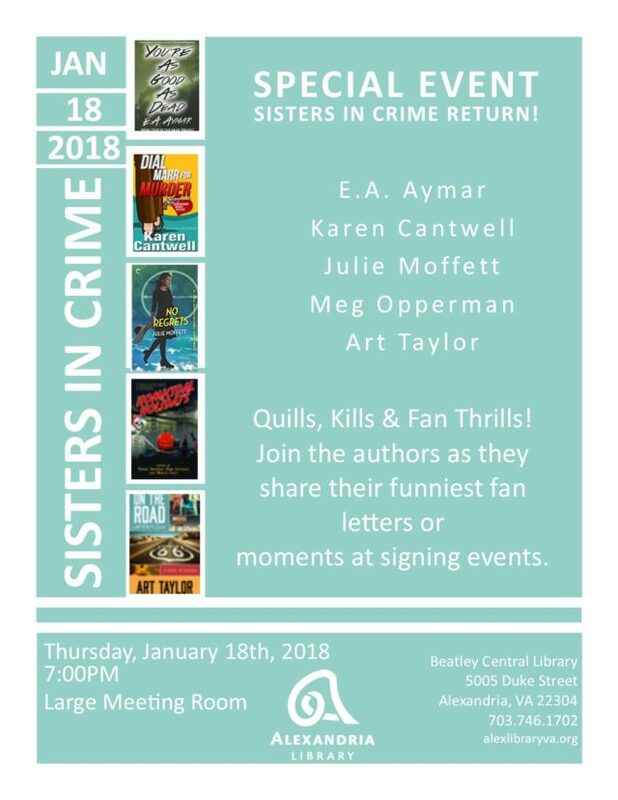 Aymar, Karen Cantwell, Julie Moffett, and Meg Opperman for “Kills, Quills, and Thrills” on Thursday, January 18, at 7 p.m. at the Beatley Central Library, 5005 Duke Street, Alexandria, VA. Together, we’ll share stories about both our writing and our writing careers—including fun (and heck, maybe not so fun!) encounters with readers over the years. E.A. Aymar is the author of I’ll Sleep When You’re Dead and You’re As Good As Dead, both from Black Opal Books. His column, Decisions and Revisions, appears monthly in the Washington Independent Review of Books, and he is also the Managing Editor of The Thrill Begins, ITW’s online resource for aspiring and debut thriller writers. Karen Cantwell is the USA Today bestselling author of the Barbara Marr mystery series, beginning with Take the Monkeys and Run and most recently including Dial Marr for Murder. Julie Moffett is the author of the White Knights series and the Lexi Carmichael series, the latter including the brand new book No Regrets, released just this month. Meg Opperman‘s short stories have appeared in anthologies and magazines, including Black Cat Mystery Magazine, Ellery Queen’s Mystery Magazine, and Sherlock Holmes Mystery Magazine. Here story “Twilight Ladies” from EQMM won a Derringer Award. Fun times ahead—hope to see folks there!